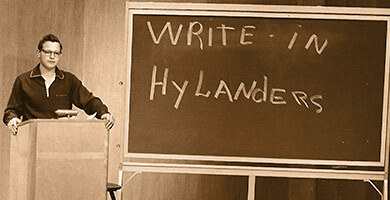 Though numerous nominations for a campus mascot 'including Rocks, Tigers, and Aphids' were presented to UCR's charter students in 1954, "Hylander" emerged from a spirited write-in campaign. Later changed to "Highlander," the theme acknowledged the campus' elevation relative to the rest of the city. Scottish traditions naturally evolved. Scottish Highlands ImageThe Scottish Highlands include the rugged and mountainous regions of Scotland north and west of the Highland Boundary Fault. 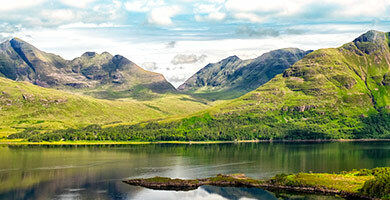 The Highlands are popularly described as one of the most scenic regions of Europe. The tradition of naming housing buildings after places in Scotland began with the first residence hall, Aberdeen-Inverness, which opened in 1959. It is named for two Scottish port cities. Lothian Residence Hall opened in 1963 and was named for the Lothian Borders in the south of Scotland. Bannockburn, which was originally an off-campus housing facility before the university purchased it, is named after a famous battle site. The new campus apartments near an arroyo at the northeast corner of campus will be called Glen Mor. "Glen Mor bisects the Scottish Highlands, so it seemed an appropriate name for an area bisected by an arroyo," said Andy Plumley, director of housing services for UC Riverside. Housing services recently purchased an existing 220-unit apartment complex formerly known as Highlander Ridge for $31.4 million. Plumley said the complex will be re-named Falkirk, for the location of a famous battle in 1298, when King Edward I defeated William Wallace. "We're the Highlanders and we like our Scottish names," he said. "We won't run out of new names any time soon." The UCR Pipe Band is part of the External Relations division of the University of California, Riverside, and serves as an ambassador for the campus. The band is comprised of a diverse group of musicians performing a wide range of Celtic music played on bagpipes and drums. The UCR Pipe Band has been incorporated into the music curriculum, enabling students to get credit for performing and taking lessons on pipes or drums. UCR is one of a handful of universities in the world where a student can earn a degree in music playing Scottish pipes or drums. 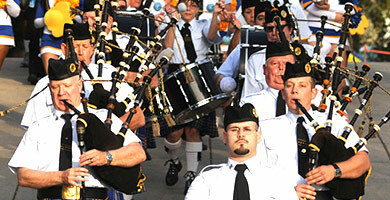 The UCR Pipe Band won first prize in the Grade 4 Pipe Band Competition in the quick march and timed medleys at the 2007 Highland Games in Flagstaff, Arizona. The UC Riverside tartan, was developed with the expert aid of Linda Clifford with contributions by pipe band members Josh Taylor & Robbie Conacher. The tartan has been registered with the proper authorities in Scotland. The graphic representation shown is an approximation of the finished tartan. The blue is a "Royal" blue, the gold slightly more brass and less mustard in color. 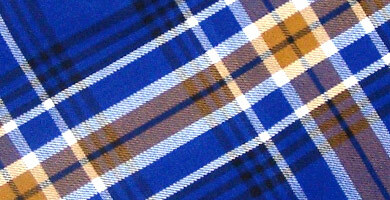 This tartan has been added to the official UCR logos and other trademark protected properties owned by the University of California. 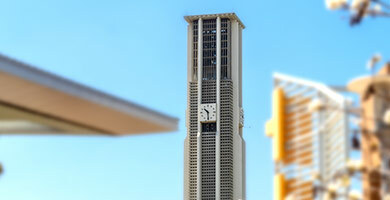 Built in 1965-66 as a gift to the campus by Philip and Dorothy Marmon Boyd, the Bell Tower is 161 feet high, weighs 15 tons with a 78-foot deep underground foundation and a 48-bell carillon. Each of the Bell Tower's 5,162 holes light up at night, creating an airy impression. Bells range from more than 5,000 pounds to just 28 pounds and are housed in a bell chamber at the top of the tower. A carilloneur plays the bells using an instrument much like an organ. During the academic year, live performances occur weekly on Mondays at noon, with few exceptions. David Christensen, appointed in 1987, is the current University Carillonneur. The Botanic Gardens are a living plant museum with more than 3,500 plant species from around the world to be enjoyed and studied. 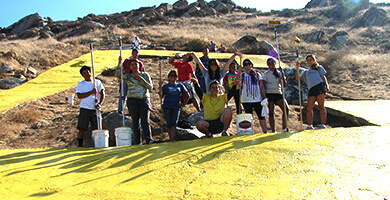 The Gardens are a source of plant materials for courses at UCR and other local schools including anthropology, art, biology, botany, ecology, entomology, landscape plants, morphology, ornamental horticulture, plant pathology, photography and taxonomy. The varied terrain and Riverside's subtropical climate create numerous "microclimates" which allow for a notable diversity of plantings. This wealth of vegetation creates a hospitable sanctuary for wildlife, where nearly 200 bird species have been officially observed. Two cottages and a stable on the east side of Mt. 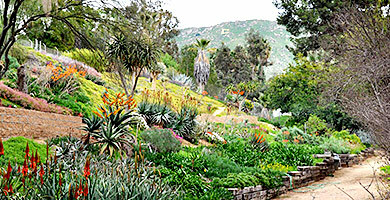 Rubidoux comprised the entire station when it opened in 1907 as part of the statewide Agricultural Experiment Station, developed by the University of California. 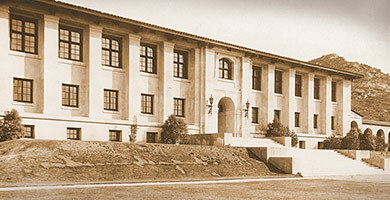 The landmark building was erected in 1917 and served as the foundation of the new UC Riverside campus when it opened in 1954. The historic structure now houses the A. Gary Anderson Graduate School of Management.